If I had to get a tattoo to represent one of my more-noticeable physical features, I’d be sporting a likeness of Pinocchio after he had told a really, really big lie. But I don’t have one, because my considerable ego wouldn’t tolerate that sort of annoying reminder of my alleged less-than-perfection. GWS reader Ben, on the other hand, is one of those glass-is-half-full types who takes full ownership of his distinctive physiological quirk. 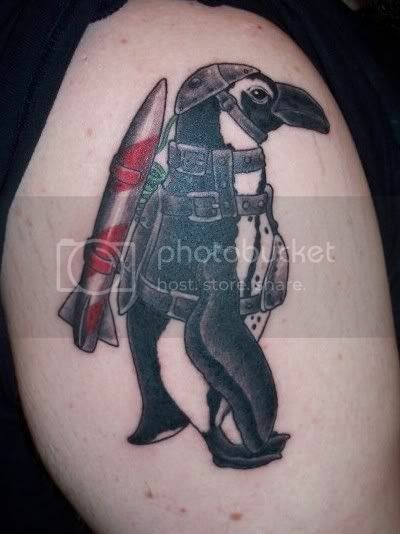 This geek’s waddling gait–caused by a skeletal malformation–inspired the proudly-brandished tattoo of a penguin commando from Batman Returns on his shoulder. That’s cool, I guess. If you’re into positive attitudes and that sort of thing. Whatever. I got this tattoo this spring in London on Camden High Street. I got it because I have a malformation in my hip joints that causes my legs, and thus my feet, to face diagonally outward making my walk more of a waddle at times. My name is Ben so in Middle school I was nicknamed “Benguin” which I was quite fond of. Add that to my love of Batman, penguins, and explosives, and the tattoo was really just inevitable. You’re a good man, Ben. Getting teased in middle school plus a fondness for explosives would have manifested a lot differently here in America. That is indeed a sweet tattoo. Looks like it probably took a while though.